High speed video is capable of bringing the ‘unseen’ into the visible world by slowing down fast-moving objects into still images that can be formed into a video file. This allows for detailed analysis and velocity measurement to determine the sources of weapon malfunction or inefficiency. 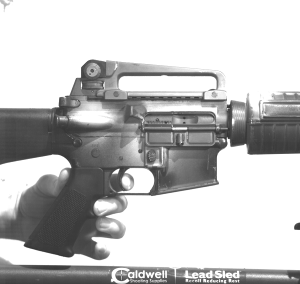 An example of this process will be presented below with the AR-15 (5.56x45mm) as an example of the possibilities of this method. 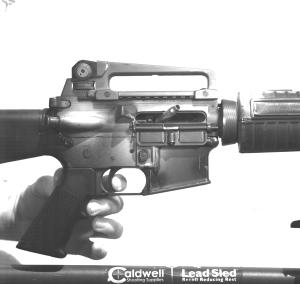 The lock time (time from trigger pull to hammer impact with the primer) is being measured on this AR-15 specimen. Additionally, brass ejection pattern can be quickly diagnosed and corrected. There is a reason that I don’t get invited to all of the parties in town—I offer experimentally backed analysis and reasonable opinions based upon that data. What I won’t be doing is stroking anyones ego by saying that whatever gun or ammunition that they use is the best. To this end, at left is a comparison of the lock time of a Glock 19 versus that of a 1911-style handgun. The experiment was originally intended to show the difference in lock time between striker-fired handguns and hammer-fired handguns. What it quickly devolved into was a caliber war between fan-boys on both sides. The fact remains that of the two pistols tested, the striker-fired weapon had a significantly shorter lock time. It should be inherently more accurate due to this more brief lock time. 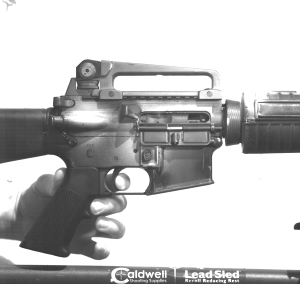 When ‘wildcatting’ or simply trying to increase the power of a conventional handgun through hotter loads, it is critical to be able to measure the bolt carrier velocity (rifles) or the slide velocity (semi-auto handguns) to determine if the rearward motion of the action is severe enough to cause concern over damage to the firearms receiver. An example of this is the below video of the Kahr P380 (380 ACP) handgun that has been converted to 9mm Police. 9mm Police is to 380 ACP what 357 Magnum is to 38 Special. A substantial performance improvement but its is a change that is sure to increase wear on the weapon. But how much does this modification impact the service life of the Kahr P380? I was able to see that the extractor claw was having difficulty moving over the larger rim of the 9mm Police case by viewing the slow motion video. When the conversion was being done and the weapon being hand-cycled to test for function, this deficiency was not noticeable. It is clearly obvious on second the video. Similar work was done with the 32 North American Arms cartridge. The host weapon was a Sig Sauer P380 which is normally chambered in 380 ACP. The 380 ACP and 32 NAA have virtually identical kinetic energies at the muzzle. As such, the rearward velocity of the slide as it impacts the frame is a secondary concern with this conversion. The advantage of the 32 NAA is that it is a bottlenecked cartridge. Specifically it is a 380 ACP case necked down to fire 32 caliber bullets. This increases the feed reliability as you are now trying to fit a smaller bullet inside of a 380 ACP chamber.